So... I had promised myself I wouldn't do it and then I caved! The problem with me is that I've never really been a woman of measure and I tend to be pretty obsessed with things that I take a liking to. For those reasons, I had promised I wouldn't hop on the twitter train. After much restraint, I did, and I kind of love it. My only problem is that I sometimes have problems divulging and get twitter stage fright. Do people really care that I had the most flaky caramelized onion and roasted tomato tart last week? that I found a new bread that I can't live without? that my food magazine obsession is becoming a real design problem in my apartment? or that I've never been apple picking and that this year will be the year for homemade apple sauces/pies/tarts/compotes/jellies? If you're on twitter, follow me here, I would love to keep up with all the food-lovers out there, and that seems like the perfect channel to do so! And in the meantime, here is my new recipe for savory bread rolls/muffins. The combo of pancetta, green onions and cheese was perfect for the cooler fall weather coming our way. Give them a try, and let me know what you think! In a separate bowl, add the milk, cream, olive oil and vegetable oil. Beat in the egg. Once the mixture is homogenous, fold in the flour mixture until completely incorporated. Fold in the cheese, green onions and pancetta. Place cupcake liners in a muffin pan. Add one ice cream scoop of batter into each and bake for 15-18 minutes or until a toothpick inserted in the center comes out clean. Lightly drizzle the muffins with olive oil and place your oven on broil. Bake them for 2-3 minutes or until the rolls are just golden brown. twitter is addicting isn't it? Yummy! Everything always tastes better with bacon (or pancetta, as the case may be). These will be perfect for my next brunch. I know EXACTLY what you're talking about. I'm still avoiding a twitter account, but I think soon enough I'll have to give in. wow! this looks incredible! i'm definitely going to give this one a try! I too was very hesitant to twitter...then I caved and havent looked back. I love being connected with other foodies! These rolls sound so good. I love the combination of the salty pancetta and parmesan! Welcome to Twitter - I'll be following you. It's so much fun! People share great links and info. And I bookmarked your rolls - they sound wonderful! I am still a bit undecided when it comes to twitter. Should I like it, love it or hate it? In the meantime these are gorgeous looking rolls! oh my..this looks and sounds amazing...haha twitter is pretty addictive. Looks so gorgeous! Any suggestions what I can use instead of pancetta to make these vegetarian? Maybe olives or capers for their saltiness? Veggie Belly: You can definitely try them with chopped greek olives. I think it could be nice to add a second sharp salty cheese too if you don't use the pancetta. I hope you give it a try! Those sound like all my favorite quiche ingredients, except in bread form! I am sorry that I have only found your site now!! I will have to come back when the kiddies are asleep and spend some quality time here. For tonight though, I am definitely trying the apple and potato fritters, they look absolutely scrumptious!!! These sound phenomenal. 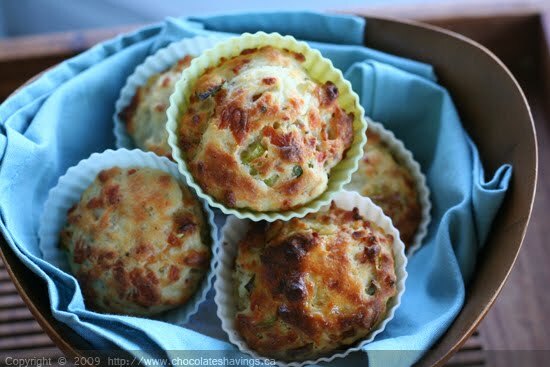 I love savory muffins over sweet! The problem with this recipe is that it doesn't say when to stir in the flour. Anonymous: Thanks for noticing, my mistake! I just added it in in the instructions. I hope you get to try them out, they are easy to make and delicious!